Since the founding of Bexar in the early 1700's, San Antonio has grown to become the second-largest city in the state of Texas and the seventh largest city in the United States. San Antonio is the seat of Bexar County. In the days prior to the Texas Revolution, San Antonio was known by several names, names such as; San Antonio de Béxar, La Villa de San Fernando, San Fernado de Béxar, San Antonio de Valero, La Villita, but most commonly known as La Villa de Béxar or simply Béxar. An expedition led by Martin de Alarcón on May 5, 1718 founded the Spanish army garrison known as the presidio de San Antonio de Bejar. The name honored Viceroy Balthazar Manuel de Zuniga y Guzman Sotomayor y Sarmiento, second son of the Duke of Bejar. The viceroy governed from Mexico City and had been instrumental in funding expeditions into Tejas. As Marques de Valero, he received a second accolade when the mission San Francisco de Solano was relocated to San Antonio from the Rio Grande and renamed, San Antonio de Valero. It later became known as the "Alamo". On June 3, 1719 with the commission issued by the Viceroy of New Spain, the Marqués de Valero to don Juan de Oliván Rebolledo appointing him governor of Texas, the Viceroy gave for the first time both the name and the boundaries for the province of Téjas. "I hereby distinguish it by the august name of His Majesty with the title of New Philippines (Nuevas Filipinas) or Philisabelia. It shall always be so designated and named. In order that it may be constituted within known boundaries and thereby distinguished from other provinces, I hereby assign therefor the Mississippi River, which runs from north to south and empties into the Gulf of Mexico, as its eastern boundary; on the south, by the coast, from the mouth of said river to the Río Bravo of the North, which empties its waters into the same gulf; on the west by the banks of the Medina River, from the sources thereof to the point where it empties into the sea; and on the north by a line drawn from the headwaters of this river to the source of the Red River of the Cadodachos, thence along this river to its confluences with the Mississippi." Source: Haggard, Villasana. "Letters and Documents, Spain's Indian Policy in Texas." (The Quarterly of the Texas State Historical Association, Volume 43, Issue 4,) Jul 1939 - Apr 1940, p. 483. The name Alamo most likely came into use as a result of the Second Flying Company of San Carlos de Parras, a company of Spanish soldiers from Alamo de Parras, from the Province of Coahuila. The company of 100 Spanish lancers, arrived in Texas in January 1803. They occupied the abandoned mission of Valero, using its buildings as barracks for a number of years. It is from this association that the mission Valero most likely came to be called by the name "Alamo". The name Béjar, or Béxar, is the name of a town in the Spanish province of Salamanca. 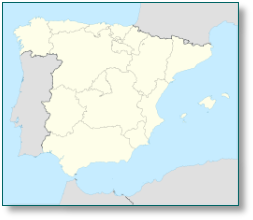 Founded in pre-Roman times by the the Vettones who were one of the pre-Roman Celtic peoples of the Iberian Peninsula (the Roman Hispania, modern Spain and Portugal). The Vettones settled an area to the south of the city now known as La Antigua around 400 BC. The city was made part of Roman Hispania in the beginning of the 1st century BC. In 713 AD, Bejar was taken by Moors from the Visigoths and in the 11th century it was conquered by King Alfonso VI of Castile. Following this, numerous fortress and the walls, many which still stand, were constructed to repel frequent Arab incursions that took place until the definitive expulsion of the Muslims. The city was later the center of the Duchy of Béjar which was created by Ferdinand III, the saint king, and ruled by the powerful House of Zúñiga, one of the oldest of the Spanish nobility. The name was brought to the New Philippines and the Province of Téjas in Nueva España (New Spain as the territory was known) where it was commonly used to refer to the presidio of San Antonio de Béxar, the mission San Antonio de Valero, the Villa de Béxar and after the arrival of the Canary Islanders, the Villa of San Fernando de Béxar. This entire group of settlements on the San Antonio river was often referred to as San Antonio de Béxar and developed into the present city of San Antonio as well as to the municipality from which modern Bexar County has evolved. However, a less likely version come from a group of historians, that claim the name may be derived from a grove of cottonwood trees growing on the banks of the acequia, (irrigation canals), Alamo being the Spanish word for "cottonwood." The Villa de Béxar was shortened to simply "Béxar", the name it was known by prior to the Texas Revolution. The Battle or Siege of Béxar which was the first major campaign of the Texas Revolution was waged there in December 1835, but not until Texas won its independence did the town come to be known as San Antonio. 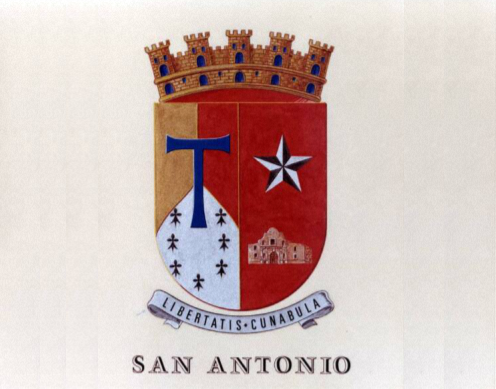 A charter incorporating the city of San Antonio was approved December 14, 1837 by the Congress of the Republic of Texas. It replaced the original charter granted to the Canary Islanders by the King of Spain. Within the year it is replaced by a second Act renaming the City of Bexar, the City of San Antonio.